By jrosenhouse on May 30, 2016. No Sunday Chess Problem this week, but I do have a good excuse. It's because I just spent the past few days participating in the Cherry Blossom Classic chess tournament. Enough with made-up chess positions! Sometimes it's good to experience the real thing. For about ten years now I've been mostly retired from serious chess competition. I've never given it up--I read chess magazines and follow the big events--but I haven't been studying or trying to improve my rating or anything like that. Sure, I would play in the big amateur team event every year, but that's really a social event where you occasionally interrupt your socializing to play some chess. However, I've managed to notch up some upsets at the team events in recent years, bringing my rating up to the exalted height of 1969. At 2000 you earn the title of “expert.” Since I've been competitive against experts for a number of years now, I recently decided it was time to start studying again and see what I could do. I needed 31 rating points to reach my goal. Did I make it? Let's find out! First let me mention that this is a real humdinger of a chess tournament. It was held at a Marriott hotel right next to Dulles Airport. The playing conditions were outstanding. The playing rooms were well-lit, and there was plenty of space between the horizontal rows of tables. No crashing into the guy behind you when you take a bathroom break at this tournament. Even better, sets and clocks were provided. No small feat with around three hundred players. And on the top boards they gave us lovely wooden sets and wooden boards to play on. 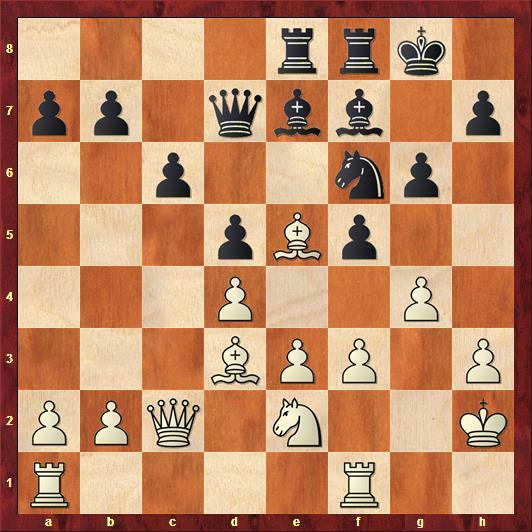 Blundering with such a set hurts double, since such beautiful pieces deserve good moves. Yawn. The exchange variation is a good choice when you're facing a higher-rated opponent. You're not going to lose quickly, that's for sure. It also takes a lot of the fun out of it for black. In the Orthodox, black accepts a cramped, but solid, position. 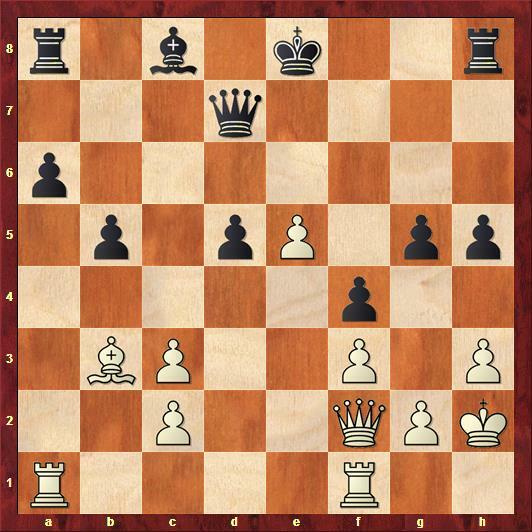 There is a lot of potential energy in his position, though, and a wrong step by white can lead to a fierce counterattack. The exchange leaves black less cramped, but it is even more difficult than usual to generate active play. My little pawn pushes on the king-side were probably ill-advised, since white now has pawn levers to open my position. He has just played 18. g4. I had anticipated this, of course, and I happily replied 18. ... Bd6. 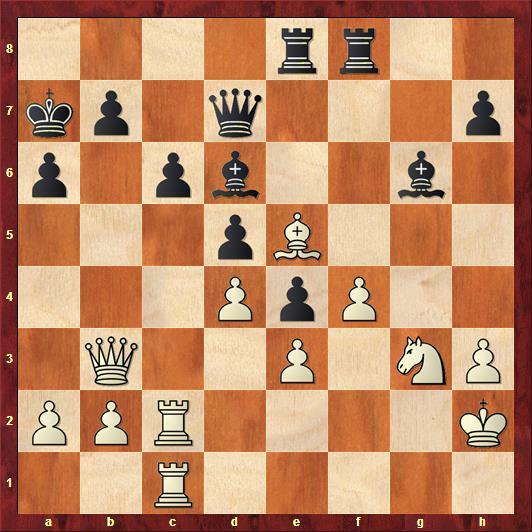 My knight on f6 is not really hanging, since white's bishop is pinned. I thought that was clever, until my opponent played 19. f4. I had intended to play 19. ... fxg4 at this point, after which I would remind him there were two kings on the board and one of them was his. But I simply forgot that after his bishop was unpinned my knight on f6 really was hanging. No time to take the g-pawn! Or is there? Frustrated by my analytical lapse, I tried to justify it by looking at the sac with 19. ... fxg4 20. Bxf6 Rxe3. 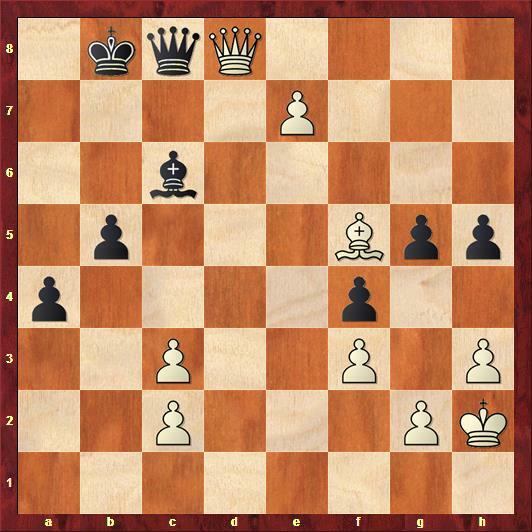 Black gets two pawns and lots of play. I looked and looked and looked. But in the end I just couldn't bring myself to do it. The computer says it is by far black's best move. It rates the position as equals-over-plus, which is to say it gives a small edge to black. Drat! 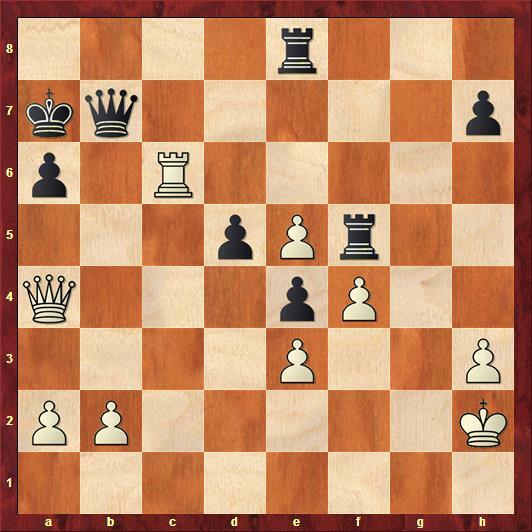 White needs a move here, since Rh5 is a real threat for black. So he went for glory with 33. Rxc6 bxc6 34. Rxc6. I had considered this possibility, but with my famous attention to analytical nuance and detail, I thought 34. ... Qb7 just refuted the sac. But this was a dumb thing to think. After 35. Qd4+ Ka8 36. 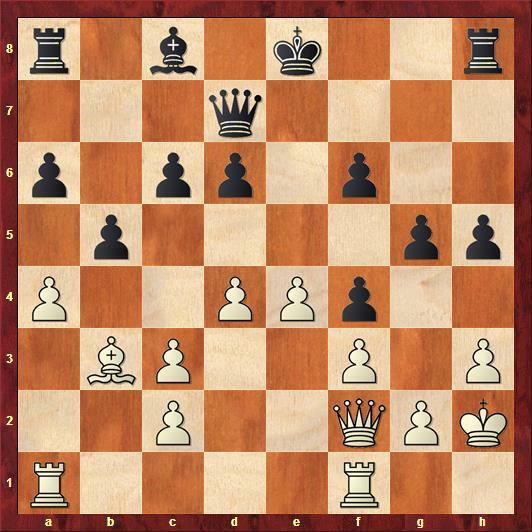 Rb6, followed by grabbing the d-pawn on the next move, white's attack is going strong. Black's rooks are too awkwardly placed to do anything. White could have won instantly with 39. Rd6, followed by Rd7. But he missed it and played 39. Qc5+ instead, after which it is a draw again. The final interesting moment came with white about to play his forty-ninth move. He played 49. Rc6 and offered a draw. He needn't have bothered, since this move actually constituted a three-fold repetition. I accepted the draw, of course. I also pointed out to him what I noticed almost as soon as I had played my last move. Specifically, that 49. Rxa6 was just a clear win. (The computer points out that Qb3+ is also a win.) White is threatening 50. Ra8 mate, and something like 49. ... Qb7 50. Qd6+ Kc8 51. Rc6+ is scarcely an improvement. My opponent replied that he looked at it, but was afraid of Qc2+ by black. I then showed him that after Kg3, black has no next move. Game over. He took it in stride, though, and was still happy to get a draw against a much higher-rated player. So, a pretty poor start to my little quest. Experts have to calculate better than that. That was actually the Friday night game. By the following morning I had shrugged it off and showed up ready to throw down. My opponent was a little kid who was eye-level with the pieces. He was also sporting an 1870 rating. Since kids at that age tend to improve rapidly, it was a real possibility that he was seriously underrated. I was white. Here's what happened. Four moves in, and we have an amusing line from the Bishop's opening. Bent Larsen introduced that funny 4. 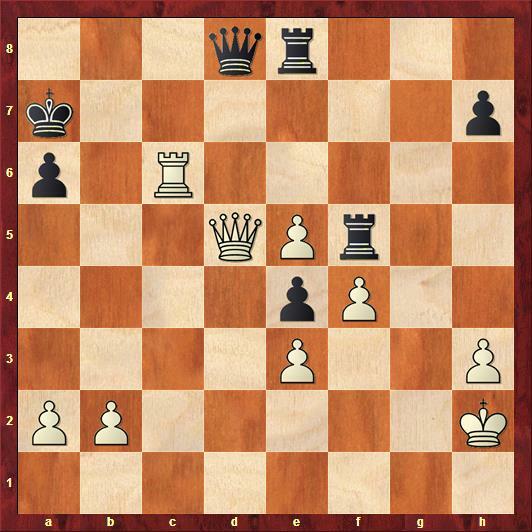 Qg4 move. 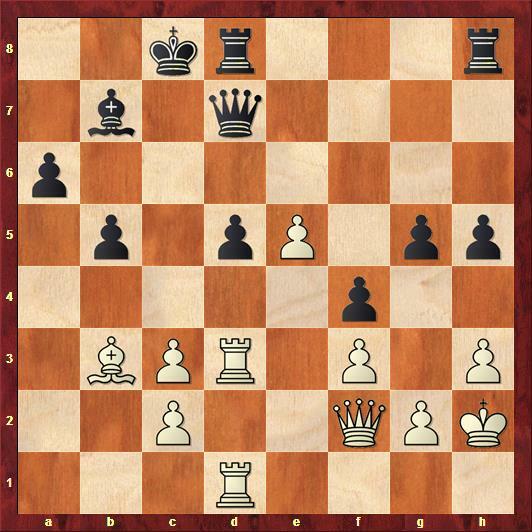 It violates some basic principles of chess development, but in this specific context it is a strong move. 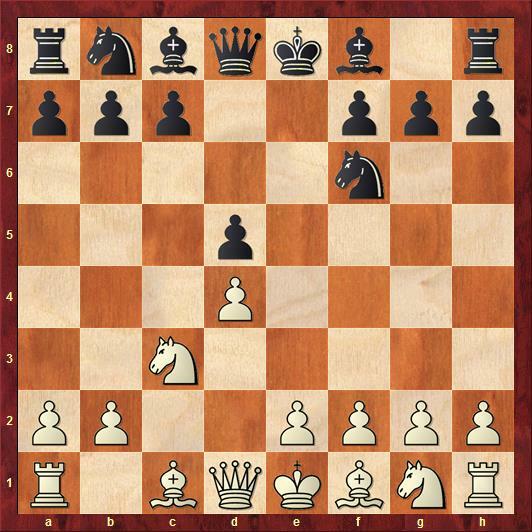 I have fond memories of this line, since at the amateur team a number of years ago, I beat a grandmaster with it. Really! And no, to answer the question my mother asked when I told her I beat a GM, he was not drunk during the game. The main point is that black gets into big trouble after 4. ... Qf6 5. Nd5 Qxf2+ 6. Kd1, and he has to be very careful just to get out of the opening alive. My opponent was plainly thrown by my move, and went in for a big think. After more than twenty minutes, he played 4. ... g6, which is relatively best. (The GM played 4. ... Kf8, if you're curious.) Those dark-squared weaknesses on his king-side are a concession, though. Let's cut to the chase. Here's the position, with white about to play his twenty-second move. I had just taken a black knight on f4 with a bishop on e3, and he had replied with exf4. For the past ten moves, black had been pretty cavalier about ignoring his development and king safety to push a lot of pawns. Time to punish him! I busted out 22. e5! 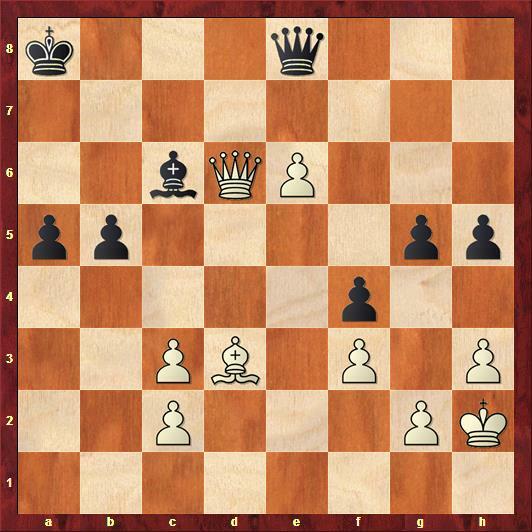 This is not really a pawn sacrifice, since if black takes twice on e5 white will quickly regain his pawn, with tons of open lines to boot. The computer says my move is winning, but is not as winning as either d5 or axb5. I was feeling pretty good about myself. Seriously, look at white's position! Just look at all the candidate moves! Qb6, Qc5, Qd4, Rad1, e6. Don't they all look delicious? I mulled it over for a while, and opted for 25. Rad1. The computer says this is winning, but that Qd4 and e6, in either order, was even more winning. black would have been right back in the game with 27. ... g4. Happily, he played 27. ... Qc6 instead. After this he is losing again. Let's skip ahead a bit. Black defended very passively. 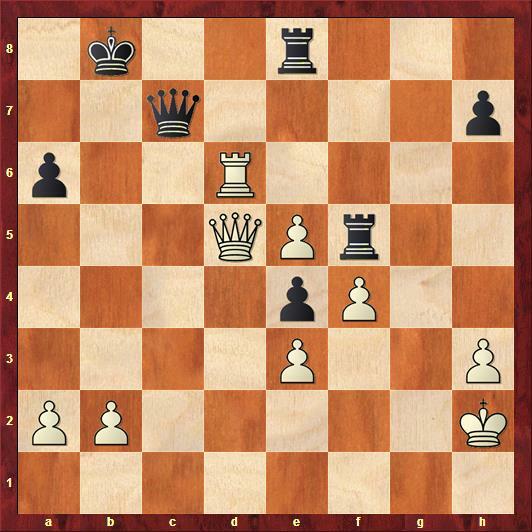 We reached this position, with white about to play his thirty-seventh move. That e-pawn is a beast, but how best to bring it home? I played 37. Bg6, which certainly gets the job done readily enough. But the computer quickly pints out the much flashier 37. Qxc6+! The point is that after black takes with his queen, the pin with 38. Be4 just ends the game. Play continued 37. ... Qc8 38. e7 a4 39. Qd8. In the run-up to this position, I spent several minutes making sure that after 39. ... Kb7 40. Qxc8+ Kxc8 41. e8Q+ Bxe8 42. Bxe8, I really was winning. It wouldn't do to have an accident with black's a-pawn racing down the board. After convincing myself (correctly, according to the computer!) that I could stop the pawn, I went for this line. Boom! Always nice to notch up the first win. My play still left a lot to be desired, though. What happened next? Stay tuned! The Epic USATE Post! 2016 Edition! Hey! Fun stuff! Looking forward to the rest of the tournament, & here's hoping you made it to 2000, which I think you certainly deserve. 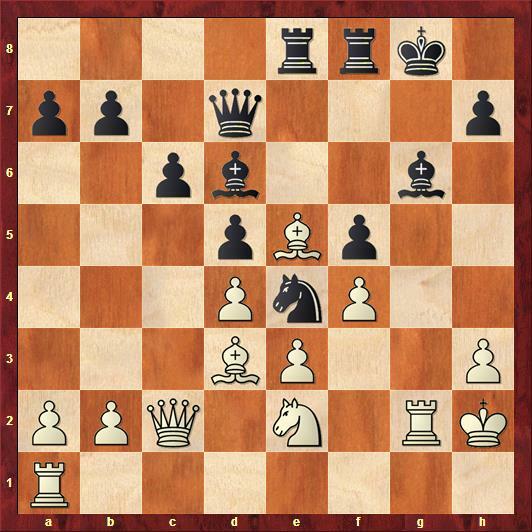 The Bishop's opening I believe to be a wonderful opening for White since I don't think most 1...e5 players have ever really studied it & there's plenty of opportunity for White to simply scare Black into mistakes. The QG exchange variation? 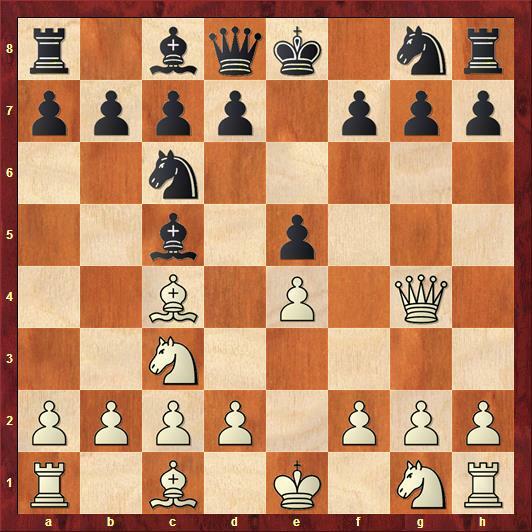 Isn't it still the case that White usually plays for the minority attack on the Queenside? Obviously not in this game. 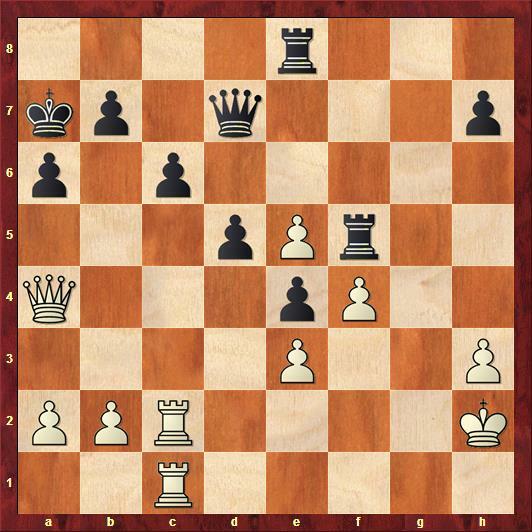 As for the exchange variation, I've seen a number of games where white goes for kingside play. White sometimes even castles queenside. I don't really know all that much about it, though.